Conrad Anker heard the call of the great outdoors early in his life and never looked back. In the incredible journey of his life Conrad has summited Everest three times, and his expedition in 1999 led to the discovery of the body of George Mallory, an English mountaineer who took part in the first three British expeditions to Everest in the early 1920s. As Conrad has pursued his accomplishments, the call of the wild has also inspired him to work to preserve the world for future generations. Conscious Connection: How did you first get into climbing? How did it come to be your passion? Conrad Anker: My parents introduced me to climbing. My family’s from central California, and we’d go out to the Sierras when we vacationed. By age 14 I was performing technical climbs, and I climbed Mt. Rainier when I was 16. One day when I was on a hiking trail, I had this epiphany that whatever I did in life, it had to be outdoors. I’m fortunate that I’ve been able to fulfill that desire by working for The North Face. Conscious Connection: How long have you been with The North Face? How did your career evolve? Conrad Anker: Well, I’ve been with them 32 years, and it’s been a good journey. I actually started working in a retail store in 1983. By 1987, I started getting product from the company to do expeditions. In 1991 I worked with Bill Simon, who was then CEO, to create the Aspen climbing team, and I then worked in house from 1995 – 1998 in sports marketing, which was a great opportunity to learn how business operates in the office environment. Conscious Connection: Where do you see The North Face and the team heading in the next couple years? And eventually, you will pass the torch . . . how do you see that playing out? Conrad Anker: Our focus is on recruiting the highest-caliber athletes, and then making sure they have the right mix of skills to work effectively with sports marketing. We’re story-tellers; we’re not solely performance-based. Of course we all have to perform at a high level, but the team members also have to be able to share their experiences with a larger population in an approachable, inspirational, yet humble voice. So ultimately it’s about finding those athletes, recruiting them, having our expeditions be authentic and cutting-edge, and then also working in a way that encourages people to exercise, to look into self-exploration, to become something other than a couch potato. You want to get people out there, outdoors – it’s that connection to the outdoors that’s important to us. And then, in terms of passing the torch, there are a couple of athletes about twenty years younger than I am, and when I retire they’ll come in as captains. It’s been nice that I’ve been able to bring them in. Conscious Connection: How has climbing changed since you started? Has the evolution of technology made it better, or was it more of an authentic experience before current technology came about? Conrad Anker: Without doubt, the biggest change in climbing is the advent of climbing gyms. When I began climbing, you could only get started with a mentor. Now, people go to climbing gyms because they want to do something that’s interactive for exercise, and then they progress to outdoor climbing. Look at Alex Honnold, for example – he’s a product of the climbing gym. Most of our young climbers, including Emily Harrington, Daniel Woods, Matt Segal, and Ashima Shiraishi, started in climbing gyms. Besides attracting new people to the sport, climbing gyms also allow climbers to train at a higher level. When we look at the overall difficulty of climbing that is now being achieved, the growth in ability is quite remarkable. Now the broader sphere of exploration, as opposed to climbing, has been most significantly impacted by computers and smartphones. You can go to Google and get a street view of just about anywhere, so there really isn’t a place left on the planet that needs to be explored for the purpose of mapping the unknown. That being said, is exploration still relevant? From a physical standpoint, from a photographer’s standpoint, it’s all been done. But what we still have is that exploration in the mind, that personal sense of the unknown. So get rid of your phone, get rid of your GPS, get rid of your cell phone and go out there. Purposely make it more difficult, make it less of an engineering problem and more of a soul-searching type thing. That need for exploration is what drives our innovation and creativity, and what has led to the advancement of humans in life. We want to find out what’s out there. It’s true whether we’re climbing or whether we’re looking into our solar system or the cosmos. Conscious Connection: Let’s shift gears and talk about your story a little more. You’ve had a life filled with great accomplishment, but also a loss of friends over the years. How do you stay focused during times of loss and tragedy, and what’s a piece of advice you have for overcoming obstacles like that? 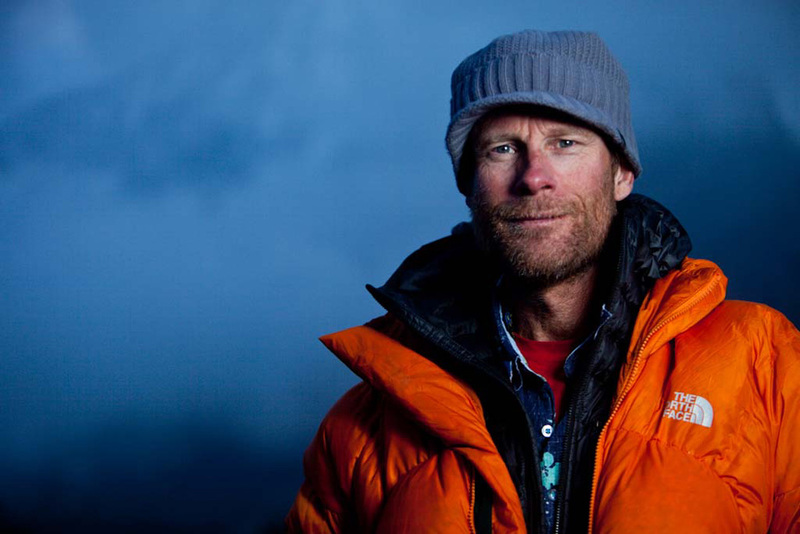 Conrad Anker: We go out and challenge ourselves in a really wild type of place, and it’s risky. When I was in my 20’s and 30’s, losing a friend in the mountains was a way heavier thing. Now I’m 52, I’m seeing that the light at the end of the tunnel is pretty damn close, and I know in 20 years I’m not going to be able to climb Everest without supplemental oxygen, like I did at age 49. So now that I’m getting closer to the end of the call, I stay focused by living in the moment and realizing that each day is a gift, and making the most of each day. We only get this one go-around, so I treat life like today is the best day of my life, and tomorrow is going to be the best day of my life. Conscious Connection: You’re a strong advocate for the environment. Let’s talk about some of your work with the Conservation Alliance and Protect our Winters. Conrad Anker: I was one of the four founding members of the Conservation Alliance, and I’ve served on the board for 12 years. The alliance was started with the idea that the outdoor industry needs to work together to ensure that wild places are protected for their habitat and recreation values. We hope that we’re preserving the earth and paying it forward for future generations. Regarding Protect our Winters, I joined the board in 2013. I’ve been involved in a project called Momenta, which opposes the delivery of coal from the Pacific west to China. In a documentary for Momenta, I talked about the receding glaciers in Glacier National Park in Montana, and how it’s very clear that there is less ice in these mountains because the climate has warmed. As a climber, I feel like seeing that is a wake-up call that we’re all cooking the planet. I feel like I need to spend some time addressing this problem, because if I don’t, then ultimately I’m partially responsible for it. I’m speaking out because I know that global warming has the potential to affect the lives of future generations. Conscious Connection: What’s next for you? Conrad Anker: I have some big expeditions I’ve wanted to do, but I hesitate to talk about future things by name. My main goal is just to be out there. It’d be nice to get after some challenging climbs the next 10 years, and also be an agent for change, be able to help people out, and get to enjoy and inspire people. Conscious Connection: Conrad, as someone who’s been very successful doing what you love, doing what you’re passionate about, what is your best piece of advice for pursuing your passions, having a positive impact on the world, and being successful doing that? Conrad Anker: First, it’s about finding what you enjoy in life. Obviously, climbing’s not for everyone. Licorice isn’t for everyone. Country music isn’t for everyone. But if you like that “whatever-it-might-be,” pursue it and do the best with it. In the end, I always go by the motto, “Be good, be kind, be happy.” That’s my life view. It’s a nice way to wake up in the morning, take a deep breath, and have that be the prism through which you live your life.